Talent Raters - Syntactics Inc.
Dare to be Greater with TalentRaters! We present you with the ultimate online stage to share your talents, grow as an artist, or simply connect with culture, music, creativity, and people from different parts of the globe. Register, upload your video, get ranked by a worldwide audience, and gain incredible exposure. Our online entertainment venue is broken down into two main categories Musical and Performing Artists, and is composed of dozens of categories and genres. Yes, Musical Artists are performing artists, but for the purpose of TalentRaters we decided to make Musical Artists a special category solely for musicians while our Performing Artists would include our dancers, models, actresses, gymnasts, comedians, and so on! 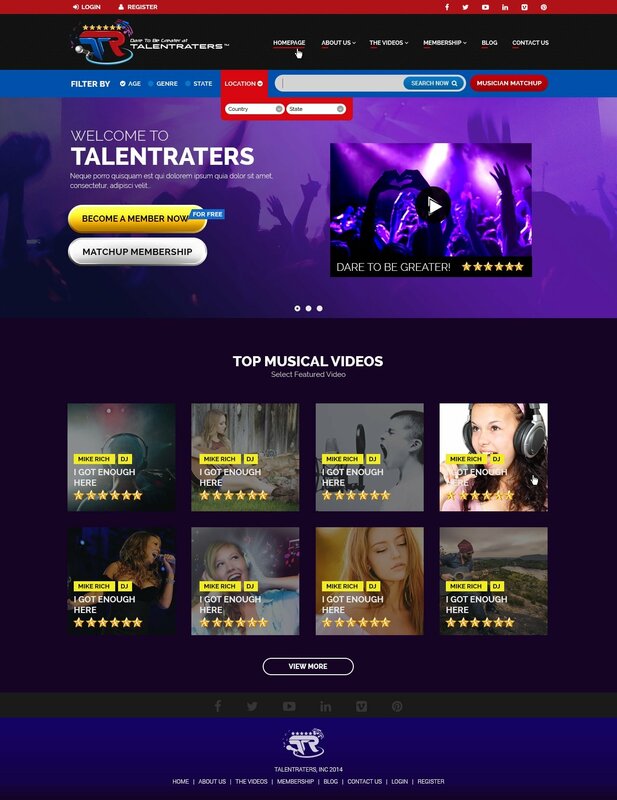 Whether you’re a rock band from Boston, MA, a country singer in Nashville, TN, a dancer from Seattle, WA, or an aspiring actress in Beverly Hills, CA – TalentRaters has a place for you.